The charcoal sky spits cold rain as we rumble to a stop at a crossroad. I nod. I can't stop thinking of what I've done. Even the smallest gestures could put my family in danger. It's easy to deflect the worry in the head of the moment, when Elliott sounds so sure. But now, away from him, breaking the prince's hold on the city seems impossible. "Don't go," Father says. "It's dangerous, Araby." "So is breathing." "Not in the same way. Araby-" He's said my name twice, within two breaths. I could almost acquiesce when he says me name like that, as if he cares. "Just because you don't want to see something doesn't mean that it will go away. Do you think inhumanity doesn't exist if you pretend not to see it? Or maybe get too drunk to understand? We've forgotten things that make life worthwhile." "Are you every truly happy? Could you be?" How can this be the most important thing he's ever asked? I want to say yes. This morning, in Will's apartment, I would have said yes, but in my mind I keep seeing Henry fall to the ground, his mask cracking. I don't say anything. I've had Masque of the Red Death on my TBR pile for the longest time and when I saw both this and Dance of the Red Death at the library, I knew I had to grab them both and just read them! I am a huge fan of Edgar Allan Poe, so finding stories that were inspired by his stories is always a treat in my eyes. Plus, Masque of the Red Death was rated highly by friends, so it all works out. Kinda. 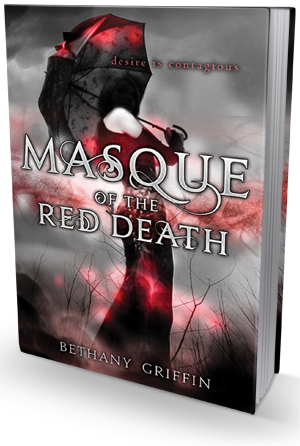 Told through the eyes of seventeen-year-old Araby, Masque of the Red Death takes places during a mysterious airborne plague that has killed numerous people and even caused some animals to become extinct. Everybody lives in fear of the plague as there is no known cure and they only preventive measures are a porcelain mask created by Araby's father. Unfortunately, production of this mask is controlled by Prince Prospero, who isn't very kind hearted. The cities are falling apart and there isn't much hope for the huddled masses. I found Araby to be a rather strong, if not conflicted, indvidual. She is thrust into a revolution - of sorts - and isn't really sure who she can trust. Elliott, her best friend's brother, says not to trust him but he continually expects her to do so. She trusted him far too easily (despite his warnings not to) and betrays those who are close to her a bit to easily, even if she does feel bad afterward. And, the inevitable love triangle addition, Will. I myself always fall for the Will's, this case being no exception. He seems much more genuine, and I'm far more sympathetic to his plight, than Elliott who seems to have a hidden agenda among his hidden agenda. I would have liked to see the characters flushed out more, to have a little more development. I feel like they were pretty stagnate throughout the novel. Although, I did see April development from a seemingly stuck up rich girl to a woman determined to fix their country's issues. There was perhaps a little development with Araby too, but not nearly as much as April. Apart from those two, I really can't tell you too much about the characters. It did take me a while to get into the story line. What kept me going was that so many of my friends liked it and I was faintly interested in finding out where Griffin was taking these characters. It felt like a lot of the first half of the novel was getting us up to speed about these characters and their lives, which is true in any novel, but it was... blah. Too much telling, not enough showing, world building, and plot development. However, I am glad that I hung on. I really got pulled into the second half of the book - where things really started to move along. There is a lot more plot development and momentum in the latter half, especially after Elliott and Araby are "invited" to Prince Prospero's castle. So while I do have a few reservations about Masque of the Red Death, I enjoyed the latter half's fast pace, the horror/apocalyptic tone throughout, and I am quite interested to see how these characters accomplish all they have in mind.